Short or medium grain rice that cooks up slightly sticky is the traditional centerpiece of East Asian meals. For information about different varieties of rice and cooking methods please see my All About Rice post. Unlike the more complicated pilafs from other cuisines, these Japanese rice combinations require nothing more than cooking your rice with one or two other ingredients, and yet these delicate additions can really enhance basic rice, both aesthetically and nutritionally. The following combinations assume, unless otherwise specified, starting with 3 cups of brown short or medium grain rice, presoaked 2-12 hours. If you didn’t have time to pre-soak as long, cook an extra 10-20 minutes. If you use white rice, you can skip the soaking and reduce cooking time and salt by half. If your sake or cooking wine is salty, you may wish to use less of it and the soy sauce.The final yield will be 6-8 portions. · Autumn Chestnut rice: Combine ½ lb baked and shelled, halved chestnuts with rice, 1 tsp salt or 1 Tbsp tamari, 2-4 Tbsp sake or mirin, and 5 cups water. Cook 40 minutes, using the same method as standard brown rice. · Autumn Ginko nut rice: Cook rice with about 3 dozen peeled ginko nuts, 2 Tbsp sake and 1 Tbsp tamari. · Autumn or winter shiitake rice: Cook rice with 10 or more soaked and sliced dry shiitake mushrooms (if you are not using the soaking water for any other dish, cook the rice in it), 1 Tbsp tamari, and 2 Tbsp sake. · Autumn or winter yam rice: Cook rice with one large sweet potato, scrubbed but unpeeled, cut into small cubes. · Winter Ginger rice: Cook rice with a 3 inch piece of ginger, very finely julienned, and 2 tsp tamari and 1 tsp sake. 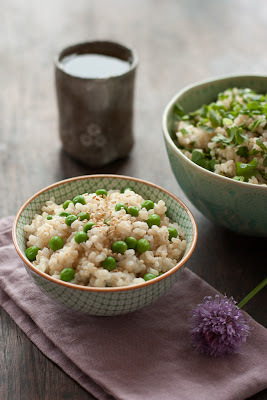 · Spring green pea rice: Blanche 1.5 cups of fresh green peas in salty water, set the peas aside, and use the water to cook your rice in (adding enough water for correct rice to water ratio). When the rice is ready, gently stir in the peas. Or, to save time, just add raw fresh or defrosted peas on top of the rice a few minutes before turning off the heat. · Spring greens congee (rice porridge): Simmered 2-3 cups cooked rice for 30 minutes in 5 cups of water, until very soft and soupy. When ready add a tablespoon each of as many spring greens as you have, very finely chopped: chives, watercress or garden cress, turnip greens, arugula, etc. If some of the greens (like kale) could benefit from longer cooking, add them first and cook a few minutes more. 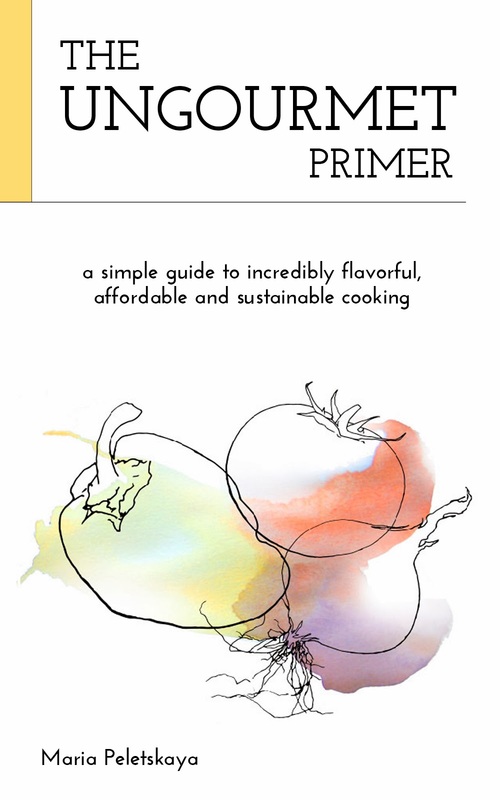 See the Congee recipe in the Breakfast chapter for pressure cooker instructions. 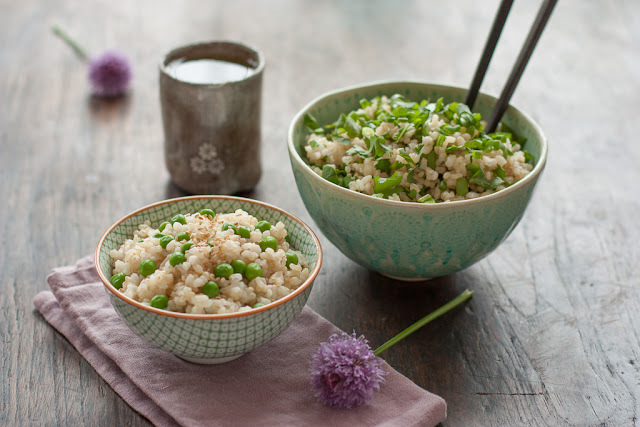 · Summer Herbed rice: Cook rice normally; when done stir in a cup or more of very finely chopped herbs or greens (shiso, parsley, scallion, cilantro, arugula, baby spinach, etc.). · Anytime multigrain rice: Cook your rice along with other grains and seeds: any variety of millet, sesame, pearled cracked barley, amaranth, teff, etc. Use as many or as few “guest grains” as you wish, and the proportions are flexible too, but try starting with about 1-2 Tbsp of the other stuff per cup of raw rice and adding 2 Tbsp of water for each tablespoon of the guest grain.